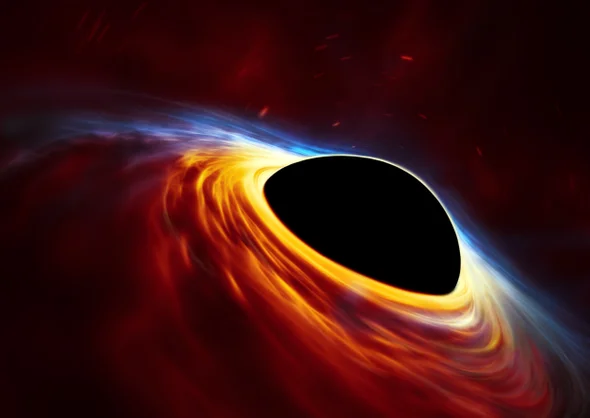 Whenever there is a picture of a black hole, (even though they are artist depictions, this is how they are described) most are shown kind of in a flat disk like this. My question is, why do we see the black hole itself? If it is sucking in material from all directions, then shouldn't the material be kind of covering the black hole, not just spinning around it to be sucked in from only the sides. Especially in the case that a star would be sucked in, then wouldn't all of its light & matter in the accretion disk be encasing the black hole? In other words, why is the accretion disk flat, and not a sphere surrounding the black hole? So if this were true, we shouldn't be able to see some black holes, only their accretion disks around them. (unrevised/old post: If a black hole is spherical and has infinite density, then it would be sucking in objects from all directions because the gravity would be the same all around. In other words, the event horizon should be all around it! I understand everything would orbit the black hole a little before 'falling in', but since the amount of matter and light is so large, shouldn't it encase the black hole, thus making it covered in a ball of light? The event horizon would be a shell so we could not see some black holes, which would mean there could be billions more out there. As for the other black holes which we have seen/proven, if the information above is true, then maybe they are the result of black holes with poles with low force/gravity/magnetivity/energy. Possibly they could be a disk of some sort or have an unequal distribution of density, either of which could lead to the flat event horizon, maybe even both. Poles on a black hole would also help account for the quasars shooting out of some. Since the gravitational pull would not be as great from the poles of a black hole, then this would allow the quasars to beam out (otherwise they would have to be going faster than the escape velocity, which is the speed of light). Maybe the quasars are even the black holes that I was talking about earlier, and this is why you would see no event horizon, only a shell of bright light. Well it doesn't exactly work the way you describe it. Matter doesn't just fall into a black hole. A black hole still has a finite mass, which means other matter orbits its just like it would a comparable object of the same mass, like a star. In fact the gravitational disturbance it causes in this way is usually how we determine that there are, for example, supermassive blackholes in the center of galaxies. Now the light you speak of is an accretion disk. When a star orbits a black hole, the star can get torn apart due to gravitational variation in the star as a consequence of the nearby black hole. Matter from the star starts orbiting the black hole, but it cant just do that in any direction. Due to conservation of angular momentum (the star itself was rotating) it is forced to rotate in one specific circular path, thats what we call the accretion disk and is the reason it doesn't become a huge sphere of light. As for light itself, it can't orbit, it either gets deflected or it gets trapped inside. Not the answer you're looking for? Browse other questions tagged black-hole event-horizon or ask your own question.